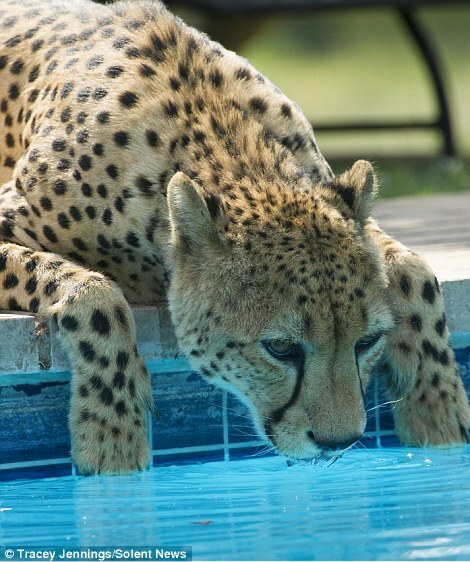 This thirsty cheetah fancied a change from its usual drinking hole...and slouched over the edge of a swimming pool to take a sip. 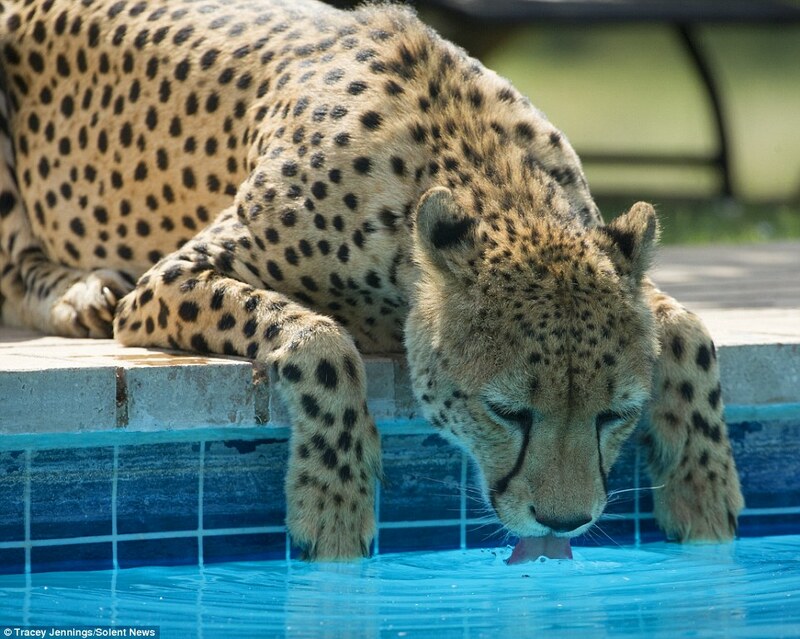 The thirsty big cat and his brother had spent the day in the South African heat hunting impala and wandered up to a lodge's swimming pool to quench their thirst. As the two cheetahs leaned over the pool - which is used by guests of the lodge - the water reflected upon them and gave them a momentary blue glow. After the pair, named Hunter and Floppy, had quenched their thirst, they retired to the trees so they could rest in the cool shade and groom one another. Photographer Tracey Jennings, 44, took these shots as she was relaxing at Tshukudu Game Lodge in Hodespruit, South Africa. The lodge is close to the Greater Kruger National Park, home to many big cats and wild animals such as cheetahs. 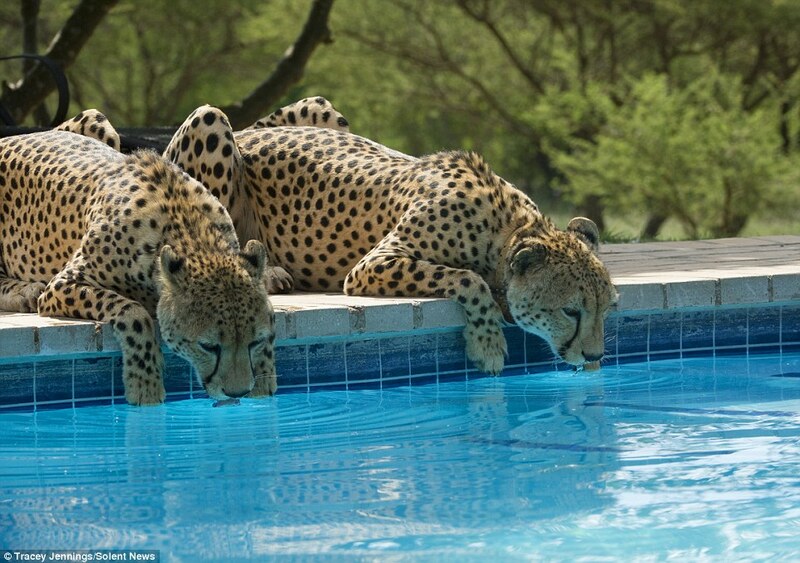 There is no fence so the cheetahs are able to just walk in and drink from the swimming pool. 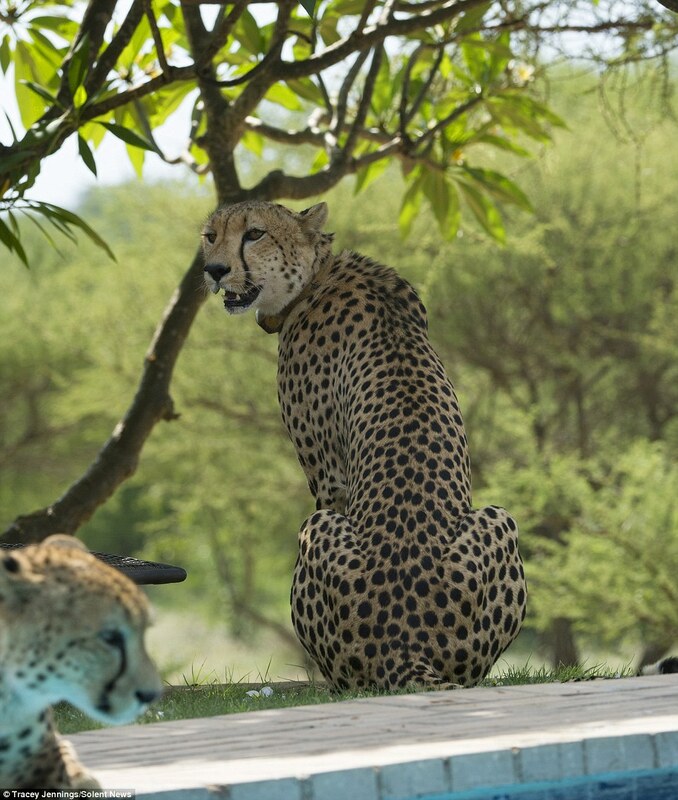 The two cheetahs and another sibling of theirs live near the lodge and are used to humans. When they were younger, their mother was killed by a lion and they were partially reared by experts at the lodge. The three big cats spend most of their time in the Greater Kruger area, but sometimes they return to the lodge for a while. Ms Jennings, who is from Leeds, said she was just five metres from the cheetahs when they came for a drink. Ms Jennings said: 'The swimming pool belonged to the lodge - it was the guest pool. 'While we were hanging out at the pool we were greeted by the two boys, Hunter and Floppy. 'They had been hunting earlier that day, and had wandered back to the lodge to sit in the shade of the tree. 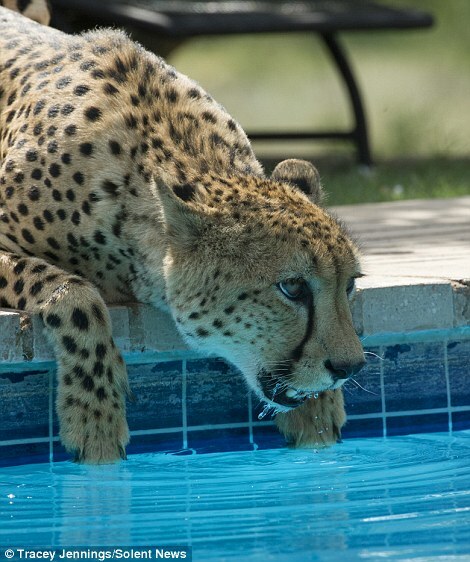 'Guests were taking pictures of the cheetahs, who were in a 'hang-out but no touching mood', and then one came to drink at the pool. Shortly after his brother joined him. 'It was such an unusual situation that I picked up my camera and started shooting. 'There is an unfenced lodge so the cheetahs can just walk in. At the lodge there are three cheetahs that are habituated so they are used to humans but hunt, and roam freely within the reserve. 'When they were younger their mother was killed by a lion, and they were partially hand reared. 'Sometimes they are not seen for days, and other times they just turn up. 'Sometimes they will allow human contact, and other times they want to be near humans but no touching. If they are injured or in trouble they normally turn up at the lodge. 'They are brothers so they hang out together all the time as a coalition. I have watched them hunt together, groom each other, eat together and sleep together.